Cowan's Fine and Decorative Art: Premier Auction features a wide array of fine paintings, sculptures, furniture, rugs, silver, and other decorative art items. 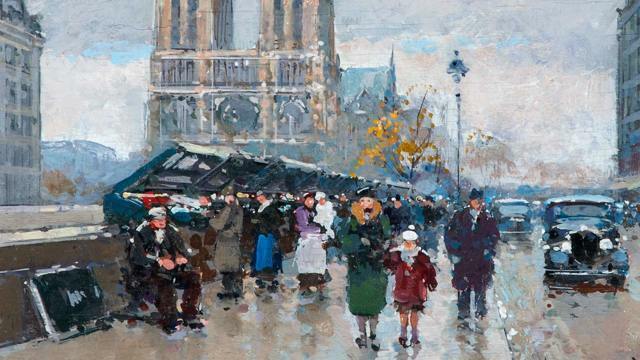 While three Paris scenes by Edouard Cortès and a bronze gazelle by Marshall Fredericks lead the way, other important works include paintings by prominent Cincinnati artists such Edward Charles Volkert and Dixie Selden, prints by Norman Rockwell, and a broad selection of American and European art. The auction also comprises a large collection of oriental rugs, a number of fine silver pieces, including Kirk and Stieff as well as Georgian pieces, and a variety of English and American furniture, including a collection of Shaker items which descended directly in the family of the last farm manager at the Union Village Shaker Community (Warren County, Ohio) and have never before been offered at auction.